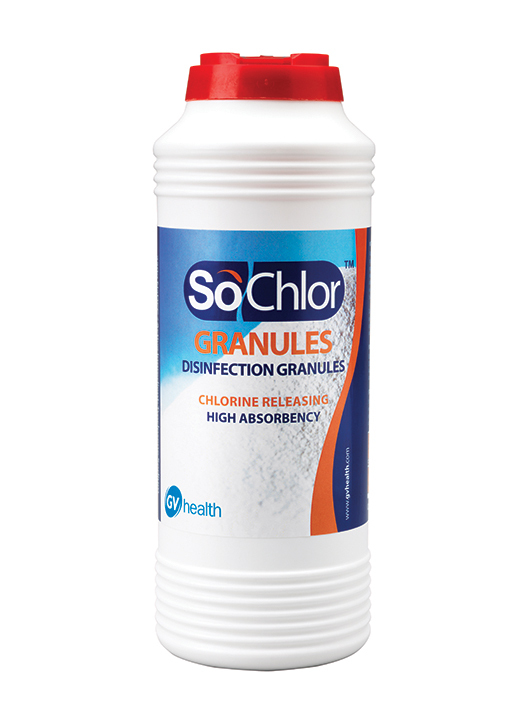 SoChlor NaDCC Granules are for safe, effective clear-up of blood spills. In the past blood spills have typically been treated with liquid disinfectants such as hypochlorite (bleach) before being mopped up with paper towels. The risk with this approach is that it fails to contain the initial spillage and risks spreading infection further. Hypochlorite is deactivated by blood and does not neutralise pathogens contained in the spillage. Fast acting SoChlor NaDCC Granules absorb the liquid so it can be safely collected and disposed of while releasing a powerful disinfectant which kills pathogens contained in the spillage. Each shaker is supplied with a scoop and scraper to enable the spillage to be safely collected and disposed of while keeping staff clear of sharps, broken glass and other hazardous items which may be mixed in the spillage.